Lead us, Lord God, to imitate the constancy of Saint Eusebius in affirming the divinity of your Son, so that, by preserving the faith he taught as your Bishop, we may merit a share in the very life of your Son. Who lives and reigns with you in the unity of the Holy Spirit, one God, for ever and ever. O God, who adorned Saint Peter Julian Eymard with a wonderful love for the sacred mysteries of the Body and Blood of your Son, graciously grant that we, too, may be worthy to receive the delights he drew from this divine banquet. Through our Lord Jesus Christ, your Son, who lives and reigns with you in the unity of the Holy Spirit, one God, for ever and ever. Devotion to the Real Presence and Growth in Sanctity | Fr. John A. Hardon S.J. Born in La Mure, France, Saint Peter became a parish priest in 1834 and joined the Marists five years later. He fostered Eucharistic adoration throughout his life and founded a religious order of priest-adorers of the Holy Eucharist who came to be known as the Priests of the Blessed Sacrament. St. Eusebius was a Roman priest of the fourth century. According to the acts relating his martyrdom he was condemned by Constantius, the Arian Emperor, to be starved to death in a room in his own house. He was buried in the cemetery of St. Calixtus. His cult has always enjoyed special favor in Rome and his house was transformed into a church. According to the 1962 Missal of St. John XXIII the Extraordinary Form of the Roman Rite, today is the feast of St. Alphonsus de Liguori. His feast in the Ordinary Form of the Roman Rite is now celebrated on August 1. It is also the commemoration of St. Stephen I, a Roman, who ruled the Church from 254 to 257 during the reign of the Emperor Valerian. He is famous for his correspondence with St. Cyprian about the validity of baptism administered by heretics. The pope's martyrdom was the beginning of Valerian's persecution. 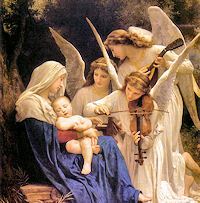 Historically today is the feast of Our Lady of the Angels. Born in La Mure d'Isere in southeastern France, Peter Julian's faith journey drew him from being a priest in the Diocese of Grenoble (1834) to joining the Marists (1839) to founding the Congregation of the Blessed Sacrament (1856). In addition to those changes, Peter Julian coped with poverty, his father's initial opposition to Peter's vocation, serious illness, a Jansenistic striving for inner perfection and the difficulties of getting diocesan and later papal approval for his new religious community. The Congregation of the Blessed Sacrament began working with children in Paris to prepare them to receive their first Communion. It also reached out to non-practicing Catholics, inviting them to repent and begin receiving Holy Communion again. He was a tireless proponent of frequent Holy Communion, an idea given more authoritative backing by Pope Pius X in 1905. Inspired at first by the idea of reparation for indifference to the Eucharist, Peter Julian was eventually attracted to a more positive spirituality of Christ-centered love. Members of the men's community, which Peter founded, alternated between an active apostolic life and contemplating Jesus in the Eucharist. He and Marguerite Guillot founded the women's Congregation of the Servants of the Blessed Sacrament. 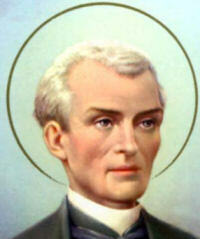 Peter Julian Eymard was beatified in 1925 and canonized in 1962, one day after Vatican II's first session ended. Make a holy hour today. You might find this work — My Eucharistic Day — from the Catholic Culture Library helpful. It was compiled from the writings of Saint Peter Julian Eymard with the permission and encouragement of the Blessed Sacrament Fathers. From the Catholic Culture library: Audience with God in Your Parish. Eusebius was the founder of the canons regular, priests living under a religious rule and dedicated to pastoral work. The canons regular was the immediate result of the rise of monasticism in the East, and St. Eusebius of Vercelli saw the possibilities of this new movement for the clergy. His example was imitated all over the West and brought about a renewal of clerical life. He was born in Sardinia and as a child was taken to Rome, where he became a member of the Roman clergy under Pope Julius. Consecrated for the see of Vercelli in 344, he gathered his clergy into a community life, founding also the dioceses of Turin and Embrun. In 355, he attended the Council of Milan as legate of Pope Liberius, which defended St. Athanasius against those Western bishops intimidated by the emperor. When Eusebius was ordered along with other bishops to condemn Athanasius, he refused, insisting instead that they all sign the Nicene Creed. When threatened by the emperor, Eusebius stood his ground and told the emperor he had no right interfering in Church matters. In anger, the emperor sent Eusebius into exile in Palestine, where he was severely mistreated by the Arians. He was moved around from place to place and after his release by the Emperor Julian he consulted with Athanasius in Alexandria on the Arian crisis. Returning to Italy, he joined with St. Hilary of Poitiers in opposing the Arian bishop of Milan and returned to Vercelli amid the rejoicing of his people. Eusebius is considered by many to be the author of the Athanasian Creed, and a copy of the Gospels written in his own hand is preserved in the cathedral at Vercelli. He died on August 1, 371, his courage in suffering for the faith inspiring other bishops to oppose the Arian heresy. Read the account of the Life of St. Eusebius from the Golden Legend by Jacobus de Voragine. St. Eusebius of Vercelli refused to "go along with the crowd," even when threatened by an emperor, and he suffered long and cruelly for his convictions. Sometimes we have to oppose others, especially in matters that are important, and how we do it is as important as that we do it. We should never lose our Christian kindness and gentle manner, even in opposing others, but it should be very clear where we stand. Arianism was a Christological view held by followers of Arius in the early Christian Church. They denied that Christ and God the Father were of the same fundamental essence, seeing the Son as a created and inferior being to the Father. (See Hilaire Belloc's chapter on Arianism from The Great Heresies.) Read what the Catholic Encyclopedia says about this heresy. Say the Apostles Creed or an Act of Faith and thank God for the gift of the true Faith. The Christology of Jehovah's Witnesses is also a form of Arianism; they regard Arius as a forerunner of Charles Taze Russell, the founder of their movement. Imitate St. Eusebius by learning how to defend your faith. Read these articles from the Catholic Culture Library: The Watchtower's Flickering Light, Christ's Divinity Proved by the JW Bible and "Unless You Drink of My Blood...". He is said to have been the chief deacon of Pope Lucius and recommended by him as his successor. He was soon involved in the case of two Spanish bishops who apparently had under persecution bought letters of safety from the persecutors. One of them, Martial, was deposed, and the other, Basilides, resigned, but then went to Rome and got the pope to reinstate him. He "imposed upon our colleague Stephen," declared the other Spanish bishops, "who lives a long way off and did not know the true facts of the case." St. Cyprian agreed that the two offenders were unfit to continue in office and the affair seems to have provoked a certain discord between him and Stephen, but what happened further is no longer known. Then Cyprian wrote to the pope in support of the bishops of Gaul, urging him to take action against the bishop of Arles, Marcian, who was accused of Novatianist rigorism but the result of this case is not on record either. An important controversy then arose on the subject of baptism administered by heretics. St. Cyprian and three African synods declared that such baptism was null and void, and that one so baptized must be baptized anew upon becoming a Catholic; this innovation was supported by many bishops in Asia. St. Stephen faithfully upheld the ancient accepted teaching that, other things being equal, baptism given by heretics is valid, and was violently abused by Firmilian of Casarea in Cappadocia in consequence. "No innovation must be introduced," declared the pope, "but let that be observed which tradition has handed down," and refused to receive the delegates of the African synod that supported St. Cyprian in the year 256. Stephen thought of excommunicating the innovators, writes St. Augustine, "but, having the pity of holy charity, he judged it better to abide in union. The peace of Christ triumphed in their hearts," but the disagreement continued. St. Stephen sent material succour to the faithful in the provinces of Syria and Arabia, and is said to have taken the first step in the emergence of liturgical vestments: the Liber Pontificalis states that he ordered that clothes worn by clerics at church services were to be kept for that purpose, and not taken into daily use or worn by laymen. From the earliest days of the Church. Mary has held the title Our Lady Queen of Angels. At the Annunciation, at the Nativity, at her Assumption into heaven, and finally at her Coronation as Queen of Angels and Men, angels have been associated with Our Lady. There are a number of famous shrines dedicated to Mary under this title, including the Basilica of Santa Maria degli Angeli at Assisi, where the great St. Francis recognized his vocation; the church in Rome which was designed and executed by Michelangelo on ruins from the time of Diocletian; the shrine of St. Mary of the Angels in Engeberg, Switzerland; Notre Dame des Anges near Lurs, France; the shrine dedicated to Our Lady of Angels at Boulogne, France; the church of Our Lady of the Angels in London, England; and the Mission of Our Lady of the Angels in Los Angeles.